Dr. McFarlane offers brief focused therapy or longer-term therapy and support as needed. Dr. McFarlane’s theoretical framework includes cognitive behavioral and humanistic orientations. Her therapeutic style emphasizes collaboration, flexibility, and understanding of the client in context. She values a variety of opinions and views. We incorporate multiple interventions to meet the individual needs of the client. Throughout her career, Dr. McFarlane has been devoted to working with clients of various cultural, racial, religious, and affectional orientation backgrounds. 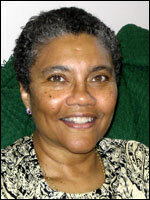 She has a special interest in providing psychotherapy for women and elders. I view therapy as a collaborative relationship with the common goal of developing healthy thoughts, feelings and behaviors. I focus on the present in an open, nonjudgmental atmosphere. …”helping people meet the unique challenges in their lives through the development of life skills.” These life skills will assist them in effectively meeting current and future challenges as well. Appointments: Monday – Friday. Please call voice mail and leave your name, phone number(s) and times to reach you. Also, indicate your preference for office location. Your call will be returned promptly, usually within 1-2 business days.